You can't beat Florida Getaways in winter! Consider Florida girls weekends, family beach vacations or romantic Florida weekend getaways to thaw out from the winter cold. You'll come back refreshed and rested...and able to make it through the rest of winter. Here are some favorite destinations in Florida including my favorite hidden gem.... Anna Maria....a perfect place for a Florida beach vacation! Also, share YOUR favorite destination for a Florida vacation or read other visitor's top picks. You will find tips and advice on hotels, B&Bs, sights to see, and restaurants....everything you need to plan your Florida Getaways. Great ideas and suggestions for Florida girls weekends or girlfiend beach vacations including the best shopping, spas, charming restaurants and more. Anna Maria Island - If you are looking to get away from it all on low key family beach vacations or relaxing Florida girlfriend weekend, you must try this charming island. Fun restaurants, lots of beach rentalsand other lodging options and a "small town feel" make this the perfect choice. 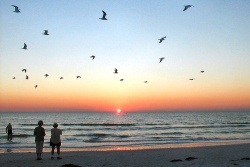 Bradenton Beach - At the Southern tip of Anna Maria Island is Bradenton Beach. The island is only a couple of blocks wide here so you are always near the beautiful beaches. Check out the restaurants, take the free Trolley and explore all of Anna Maria Island. Sarasota - This city is a great combination of shopping, culture, sights, restaurants, hotels and beaches. If you are looking to be near a "happening" town on a girls weekend in Florida, check out Sarasota. Palm Beach - If you are looking to mingle with the "rich and famous", want to celebrate a special anniversary, or check out the mansions and "shop till you drop" on weekend girls getaways....consider Palm Beach as your destination. You will find top notch restaurants, shopping and hotels! I hope you enjoy perusing these great destinations for your next getaway to Florida or girlfriend getaways! Be sure and check back as we continue to add new places to this list. What do you consider to be the best Florida getaway? Maybe you discovered it on a weekend getaway, girls weekend or Florida vacation. Please share it here....we would love to hear about it!